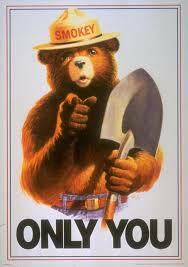 Only You Can Prevent Fires! Must obtain Nez Perce small burn permit (Permit Application below). Read and understand letter from Nez Perce Air Quality Program Coordinator. At least 24 hours before open burning, call The City of Kamiah at 208-935-2672. Inform staff of date, time, your name, address, phone number and what you are burning. 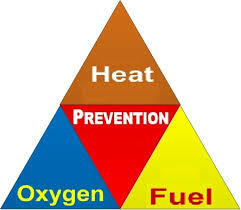 Prior to burning, refer to fs.usda.gov/main/nezperceclearwater/home website for fire danger information. You may not open burn on days when the Forest Fire Danger is High or greater. Open burning is prohibited (city ordinance 8.20.020) May 10th through October 5th. Recreational, warming fires and food preparation fire are allowed as long as fire pits, campfires or barbeques have enclosed fire ring not to exceed 3 feet in diameter, fires in fire ring are not ignited within 25 feet of structure or combustible material and a responsible person with fire safety knowledge is present at fire at all times. 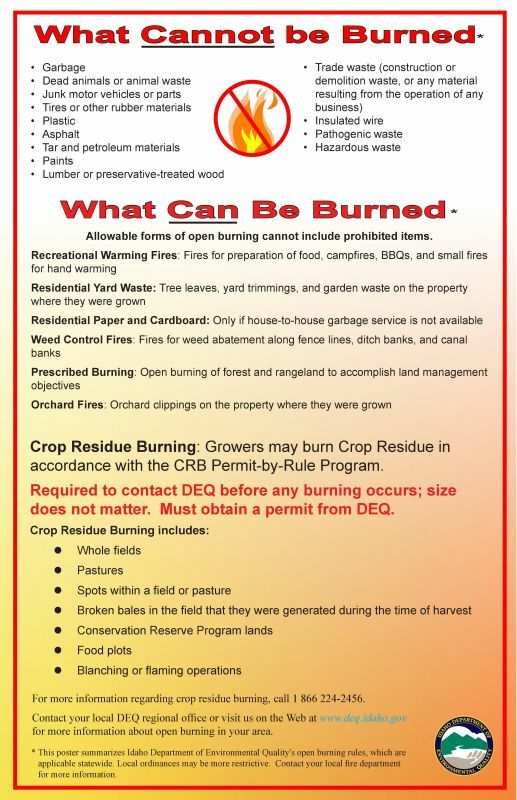 Open burning is allowed (city ordinance 8.20.030) October 6th through May 9th to control or alleviate fire hazards, such as weeds, tree remnants and any dry vegetation. Recreational, warming fires and food preparation fire are allowed as long as fire pits, campfires or barbeques have enclosed fire ring not to exceed 3 feet in diameter, fires in fire ring are not ignited within 25 feet of structure or combustible material and a responsible person with fire safety knowledge is present at fire at all times. Restrictions for open burning include but are not limited to: burning of garbage, trash refuse, household solid waste, construction or demolition waste, tires, plastics, rubber toxic or hazardous substances, or other substances as may be prohibited by state of federal law, open burn within 50 feet of structure or combustible material and create a hazard to persons or dwellings, or cause excessive smoke or offensive odors. Once all permit conditions are met and you decide to burn, call Lewis County Sheriff’s Office at 208-937-2447. 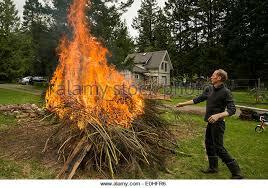 Advise the dispatcher that you will be burning in the City of Kamiah and the location. You must call prior to and after burning. The property owner assumes all responsibility for compliance with the above requirements, the City of Kamiah Ordinances and also for any damage caused by smoke or fire. For Residents living in Lewis Co.